Title: 'Cornwall olim pars Danmoniorum'. 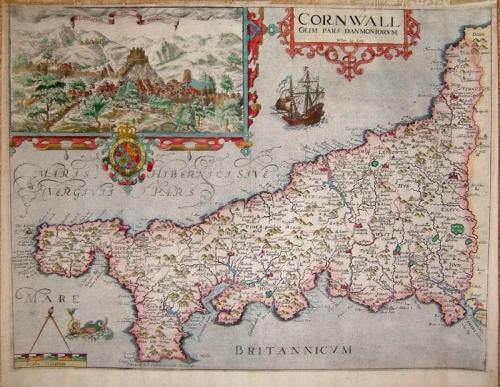 Original copper engraved map of Cornwall issued in 1610 in William Camden's 'Brittania' based upon the work of Christopher Saxton. The map was engraved by William Kip. One of the very earliest maps of the county. The map is in very good condition with only the remains of some masking tape from a previous framing in the top margin.